Unlike most big lottery winners who spend days, or even months, trying to figure out how they'll spend their newfound riches, Tom Crist needed only a moment to decide where his $40 million in winnings would go: all to charity. Top on the list would be the medical center that cared for his late wife when she developed cancer. Still, it took Crist more than six months to tell anybody — including family members — he'd won. The retired Calgary executive had been lunching between rounds of golf in Palm Springs when his cell phone rang and he was told the news. "I was speechless," Crist, 64, said in a recorded interview with Canadian public radio station CBC. "I really didn't know what to say." "I knew where the money was going to go as soon as I got that call," he told the CBC. "I just didn't want the media, the press, all that kind of stuff. So I just kept putting it off and putting it off, and putting it off." Finally at the behest of the Western Canada Lottery Corp., he agreed to go public and have his photo taken. The fine print on the lottery subscription he'd bought had demanded as much. "They asked, 'Is that your natural look?'" Crist told the CBC. "I said, yep. That's all you're getting. You're not getting a smile, nothing." The former CEO of EECOL Electric said he didn't need the money for himself or his family. "I guess I've been fortunate enough through my career, you know, that I had, with the company that I was with, to be fortunate enough to have a good living and be able to remain to have a good living and look after my kids," he told Reuters. "So, I don't really need the money." "It's very, very, very important," he told the CBC, his voice starting to crack. "Because, you know, we lost a wife, a mom and a grandma. She beat it for a while, six years, and it finally caught up with her." All of which made it supremely important for Crist to donate to cancer treatment and research. "Cancer is dear to my heart because of what happened to her," he told the CBC. "This just gives me the opportunity to give back." Crist delivered his first big check — $1.2 million — on Tuesday to the Alberta Cancer Foundation, which collects donations for Calgary's Tom Baker Cancer Centre, where Jan had been treated. "He surprised us," Dey said. "He said that this is phase one of his gifts and that his intention with us was to make an annual gift. He stressed that this was just the beginning and that he intended to give away all $40 million." Crist's son, Dallas, told Global News Calgary that he only learned about the $40 million when his wife called after having seen a news report. "You gotta tell a secret, that's the one guy you tell a secret to," Dallas told Global Calgary. "We had no idea. He didn't change one bit. We had no clue. He is the most secretive man on the planet." "He'd do anything for anybody," Dallas Crist told Gobal News Calgary. "He'd give you the shirt off his back. He's my role model, for sure." The donation, Dey said, "will go to enhance care for other patients. It will help an awful lot. He told us that he had been successful in life and already had enough money to take care of his family and that this is what his wife would have wanted. He was doing it in her name." Though Crist acknowledges that his actions may spark generosity in others, "I'm not doing it because it's going to inspire somebody else," he told the CBC. "I'm doing it because that's what my heart tells me to do." 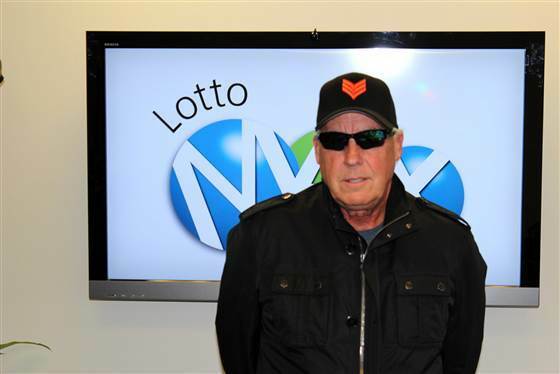 (Click to display full-size in gallery) "You're not getting a smile, nothing," Tom Crist told the cameraman for the required Western Canada Lottery Corp. picture. Crist donated the entirety of his winnings to cancer research in honor of his late wife.